Do you remember those days when your grandparents used to tell you stories while sitting in their favorite rocking chairs? Did you ever experience the thrill of being rocked back and forth on that chair for the first time? For some people, rocking chairs are endearing parts of their lives. But, do you know that rocking chairs also have their own stories to tell? If not, here's the history of rocking chairs that not all of you may have heard about. This Antique Baby Rocker is for sale now in our shop. The original inventor of the rocking chair is still unknown. Though some stories attribute its invention to Benjamin Franklin, no historical evidence can prove them right. Historians can only trace the rocking chair's origins to North America during the early 18th century. They were originally used in gardens and were just ordinary chairs with two rockers at their bottoms. It was in 1725 that early rocking chairs first appeared in England. They were also used as garden chairs and had hoop-shaped backs. 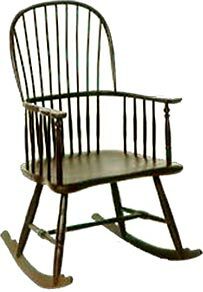 The distinction of being the creator of the first popular rocking chair design actually belonged to England's North American colonies. Windsor rockers, as this design was called, were first built near the Windsor Castle in the early 1700s. These rocking chairs featured a round hoop back, a birdcage (with spindles known for its cage-like appearance), and a comb-back (with comb-shaped head rest). 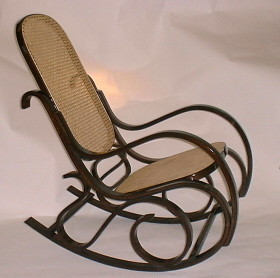 The wicker rocking chair was another popular design created during that time. 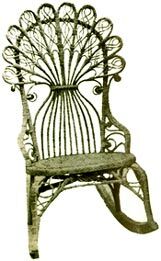 The production of wicker rocking chairs reached its peak in America during the middle of the 18th century. These wicker rockers, as they were popularly known, were famous for their craftsmanship and creative designs. Michael Thonet, a German craftsman, created the first bentwood rocking chair in 1860. This design is distinguished by its graceful shape and its light weight. Thonet used bent steamed wood for these rocking chairs. Because of their affordability and beautiful design, bentwood rocking chairs not only became famous around the world but spawned countless imitators as well. Neoclassical designs also became a trend in the US during the 1890s. These rocking chairs were influenced by Greek and Roman designs as well as Renaissance and colonial era artistry. 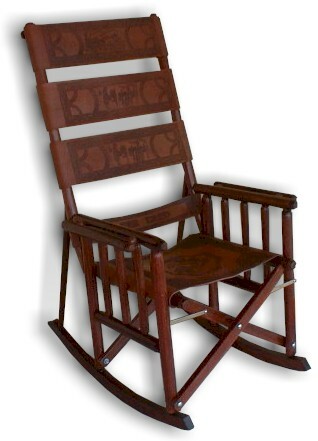 During the 1920s, however, folding rocking chairs became more popular in the US and in Europe. They were handy for outdoor activities and travel purposes. By the 1950s, rocking chairs built by Sam Maloof, a US craftsman, became famous for their durability and deluxe appearance. Maloof's rocking chairs are distinguished by their ski-shaped rockers. I have to say that this is without a doubt my Favourite item we have in our shop at this time. Today's rocking chairs are distinguished by their diverse materials and cutting edge, sometimes outrageous, designs. 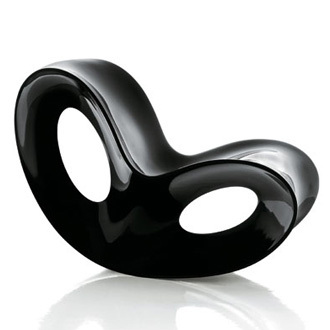 One of the modern era's most unique was created by Ron Arad in 1990. The single volume rocking arm chair is made of steel that also tilts upward when it is not used. Meanwhile, Peter Opsvik of Norway created the "gravity balance" in 1999. 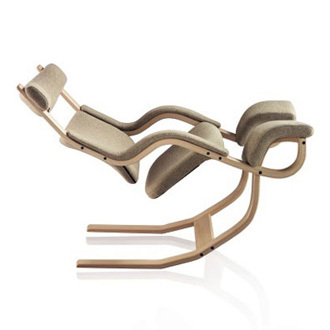 This ergonomic rocking chair allows the sitter to relax or stretch through its four positions. Another unique one was created in 1999 by Illka Terho and Teppo Asikaine of Sweden. Known as the "chip lounger," this rocking chair is shaped like a surfboard. In 2001, MAC Sports, USA released the "malibu" rocking chair, which can be folded up completely into its own carrying case.